Where does the Euro strength come from? Stock market volatility has calmed down a bit and most markets ended the week on a positive note. We have a few more lunar green period days to go and then we will enter a new red period. If the market is going to retest and possibly take out its recent lows, then its best chance to do so is probably in the second half of September. The S&P is looking for direction after the late August drop. 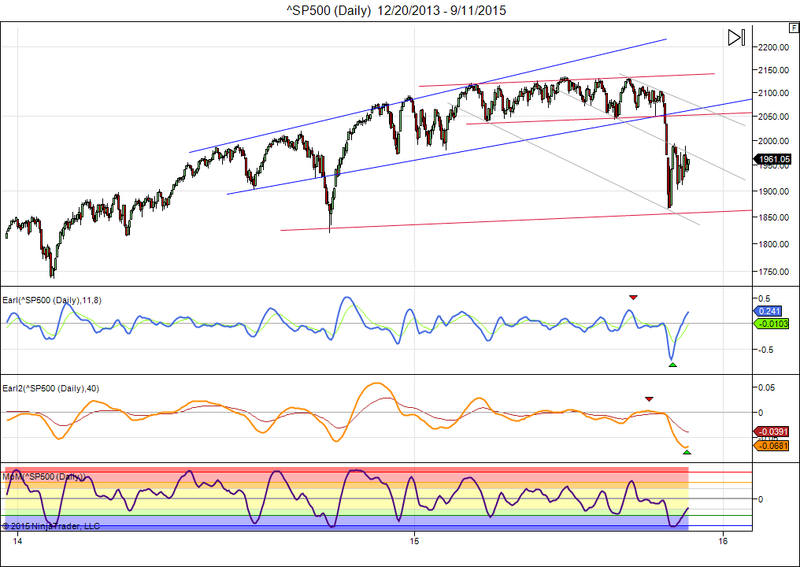 If the market pushes higher then 2050 could be reached fairly quickly. The slower Earl2 indicator (orange line) has turned up from a major low, which is good to see, but that doesn’t rule out another leg lower in the next couple of weeks. The faster Earl (blue line) is going quite high already and may turn down this week. I think the better odds are for a push towards 2040, followed by consolidation for the rest of the month. A lot of traders will be watching central banking decisions this week. I don’t know whether it will make any difference. I can easily imagine interest rates being nudged higher and see stocks go up rather than down as a result. Would be a typical example of “sell the rumor, buy the news”. Many investors have been selling the ongoing rumor that rates are going to be hiked, so who will be left to sell? It is the uncertainty of an upcoming rate hike that has been hanging over the market for months, and once the step is taken that uncertainty is taken away. We can actually ponder what would be more positive for stocks: keeping rates at zero while telling people that the economy remains too weak… OR raising rates and telling people that the economy is strong enough to do so? Since March the Euro has been painting higher highs and higher lows. The 1.15 level has been major resistance for a while and the most recent attempt to break out above it failed. Bullish energy (green in the iceberg chart) is once again rising quickly, so a second attempt appears to be in the making. It is not clear where this Euro strength is coming from. But it is not rare for markets to move first, with the fundamentals that justify the move becoming clear later on. Anyway, a successful break above 1.15 would open the door towards 1.25. Our key tables and comments for this week, now in slideshow format. Click the “Expand” button (bottom right) to watch in full screen mode. Click on “Slideshare” (bottom left) if you want to save and print it. Our key tables and comments for this week, now in slideshow format (click on expand button to see in fullscreen). If you have any trouble to see the presentation below, then you can also watch it directly on slideshare. * The FTSE100 index has gone into fully bearish mode, the first major market to do so. The DAX is weak as well, but still holding above its weekly key reversal level. Both are testing their Bottom1 targets already. The US markets have been stronger and remain bullish with upward MoM on the weekly level. * In the daily key levels all major stock indexes are showing downward MoM, which means a pullback is underway. Is it the start of something bigger? That is always possible. Every bear market starts with one down candle and with one down swing. Right now there is no reason for panic, but if the US and Japanese market also drop below their daily key reversal levels, then the outlook for stocks will darken. So I wait and see. 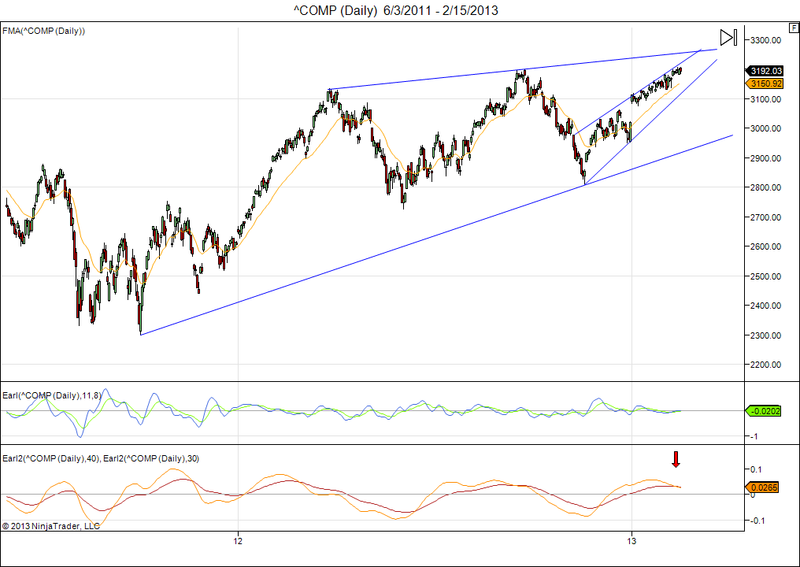 * For the Nasdaq we have a new Top2 target at 4659. * In other world markets the French CAC 40 has gone into bearish mode. Several other European markets are coming close to do so as well: Italy and Switzerland. New problems brewing in Europe? Hmmm, just old problems resurfacing… Weekly MoM has also turned down for the MSCI World index, marking a possible long term peak. * Bonds (TLT) have bounced back, but weekly MoM keeps pointing down for the bond market. * Gold is back to fully bullish. $1415 is the Top1 target if we get another leg upwards. Now it is becoming DO time for gold. * The Euro is stuck around 1.36. Key levels are bearish for the Euro at the moment, but that doesn’t mean much in a market that has been going sideways for so long. A big move will come, but which way? Plenty of traders are probably looking to go long Euro on a breakout above 1.40, or to go short on drop below 1.34…, and that may or may not work, as fake out moves have become common. In a coiled market like this one I like to take a look at the monthly key levels for direction. Monthly MoM for $EURUSD is going down since May (it had been going up since August 2012) and a monthly close below 1.3264 would confirm the next major move is indeed down. * Our weekly key reversal levels for the 30 Dow stocks are available here. 28 stocks are bullish this week, up from 27 last week. Above 20 is healthy, see : Keeping an eye on the Dow stocks. * A reader wrote me to tell how boring it is, e.g. my posts keep repeating “healthy bull market” for the Dow Jones week after week. If the key reversal levels are boring it is actually a good sign, it means they are not pointing in a different direction every other week. And that can only mean we are getting good trending moves. E.g. the Nasdaq has been in weekly bullish mode for 79 weeks and counting. It doesn’t get any more boring than that. When we started posting them the weekly key reversal level for the Nasdaq was at 3221, now it stands at 4109, so that is 900 points of Nasdaq profit quietly locked in by our key levels. Meanwhile plenty of other analysts/bloggers have been trying to nail the top since the beginning of last year (if not before). I am sure they have not been bored. But how much have they lost by now (provided they trade their own calls)? 20%, 30%, more? By the time we actually do get a correction it will perhaps give them back half of the money they lost, or back to breakeven if they are lucky (provided they have not given up trading their own calls by then). That’s a big price to pay for being able to say “told you so”. Some day our key levels will stop saying “healthy bull market”. Maybe next week, next month, next year… It will come. Here are the updated tables. The Week Ahead: Should You Reconsider Buying the Dip? * Stock markets are hesitating after the recent series of new highs. On the weekly level the bull markets are intact, but in the daily key reversal levels we now see all major indexes with downward MoM, and the FTSE100 has fallen into bearish mode. This can be considered a first warning sign. * In other world markets the Chinese markets is grabbing upward MoM and coming very close to going into bullish mode. Most markets remain well above their weekly key reversal level. * Bonds (TLT) are trying to get into rally mode again. TLT needs a daily close above 112.54 to do so. * Gold has strengthened further. A weekly close above $1311.12 would turn gold fully bullish, and would probably give us a good trending move. Keeping an eye on it. * The Euro is still weak, but is not giving up too much territory. MoM is to the downside, but as long as the Euro hovers near 1.35 it wouldn’t take much to turn things around. * Oil has finally cracked above its Top1 target at $104, so now the path is open for a climb towards 109-110, where our next price targets are. * Our weekly key reversal levels for the 30 Dow stocks are available here. 26 stocks are bullish this week, down from 28 last week. Above 20 is healthy, see : Keeping an eye on the Dow stocks. Yesterday the Euro/US$ closed above its daily key reversal level and is now officially in rally mode. It still needs a weekly close above 1.3188 to get into bullish status again. 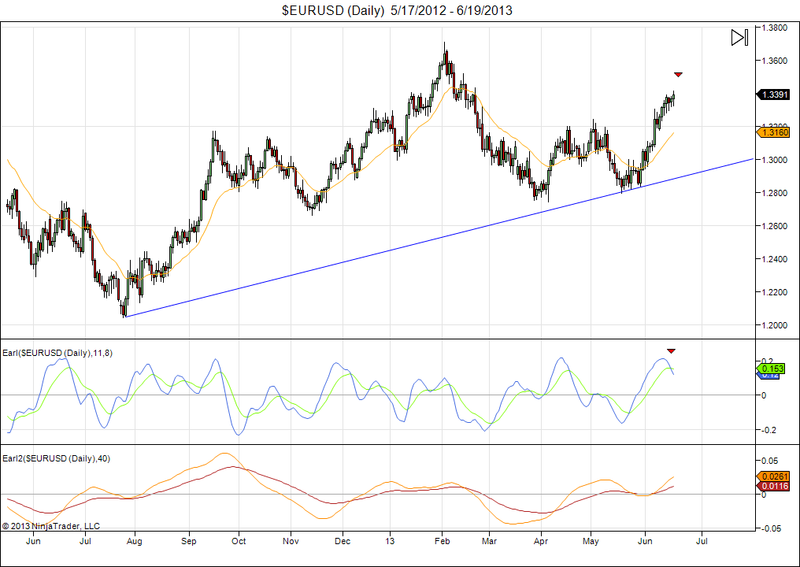 The Euro could be pointing the way forward for several other markets as well. E.g. gold has been moving up and down with the Euro in recent months, so if the Euro rallies further, then look for gold to get into rally mode as well. Gold has failed to close above its daily key resistance so far this week, but I would expect it to break out to the upside if the Euro continues to go up. The US stock markets have done just the opposite, they have been going down whenever the Euro went up since February. So, if this negative correlation continues, then a further rise in the Euro would mean new downside action in the stock market. So, that’s several good reasons to keep an eye on the Euro, even if you are not trading currencies. 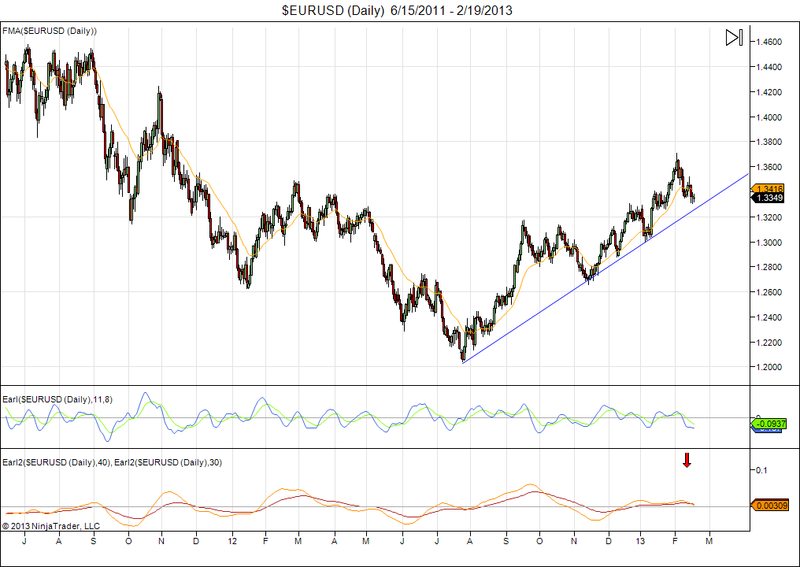 The 1.34 level also happened to be our upside target for the Euro. Meanwhile, both the Nasdaq and the S&P 500 have closed above their daily reversal key levels, putting them in rally mode again. Their daily support key levels are now at 1626 for the S&P, and at 3422 for the Nasdaq Composite. If they fall back to close below these levels within days, then it would indicate a false breakout and probably a sharp swing to the downside. If the market can hold on to the gains, then look for a further rise into July. Gold weakened significantly yesterday, in line with the sell signal we posted last week. There is a chance that the $1350 level will hold for a triple bottom, and then things would start looking better going forward. If the support at 1350 gets broken, then gold can go to 1200 or even 1100 rather quickly. Markets have continued to move in line with expectations. Most major indices remain near overhead resistance lines, but there is no breakout to the upside (yet), and meanwhile we have entered a lunar Red Period. This market has reached our 3200 target, but seems to struggle to go higher, as we expected. 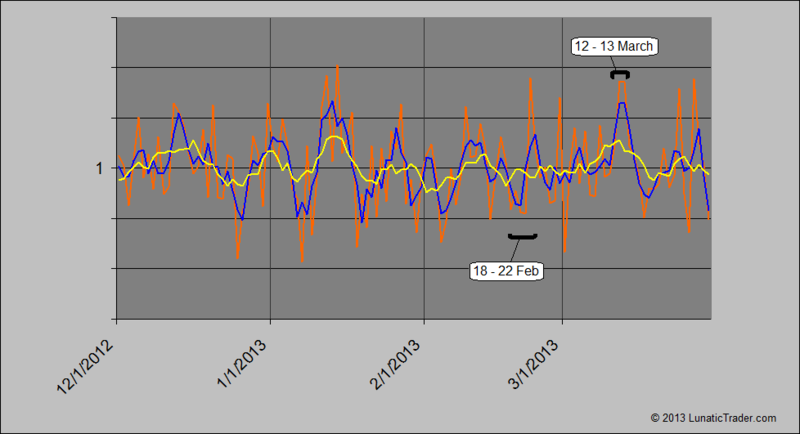 I continue to look for a minor pullback in the next weeks and then another rally attempt in early March. The Earl2 indicator is now clearly turning down. This means that any new highs we may see in the coming weeks, will be opportunities to sell and take profits. By the time the Earl2 bottoms out we will likely be able to buy at or below the current levels. This means we should at least tighten our stops and be ready to get out as soon as a broader decline sets in. Currently, a close below 3140 would be a strong indication to get out. Today I also want to introduce something new, which I have been working on for a couple of months. The purpose of this wave chart is to spot shorter term moves (a few days) and to identify potential peaks and bottoms in advance. It also helps to estimate the strength or weakness of upcoming lunar red and green periods. The lunar cycle is a major ingredient in this chart, but not the only ingredient. There is a “secret sauce”, so to speak. The orange line shows the daily signal, while the blue line is obtained by applying a 3 day smoothing filter, and the yellow line uses a 9 day smoothing. Values above 1 indicate strength, below 1 suggests weakness. I mostly use the blue line. For this week the LT wave suggests weakness until Wednesday-Thursday, but Friday shows a strong upwards spike, which will be the peak value for February. In March we will get peak values on the 12th and 13th. If we get new highs on any of these days, then it are supposed to be good chances to take profits, or initiate positions to benefit from a downside move. The Euro has dropped back from its recent peak, and my Earl2 indicator is turning down. The shorter Earl is well below zero, which means we are likely to get an upward bounce first, before turning down and fall further.